Currently, a Hyatt Diamond Suite Upgrade can be used towards reservations past the expiration date of the Upgrade, provided that no changes are made to the reservation after the expiration date. For example, this year’s DSUs expire on February 29, 2016, but if you apply them before that date, they can be used for reservations on March 1st, 2016, or any day after. I have confirmed from Hyatt spokesperson that, starting with Diamond Suite Upgrades received on March 1, 2016, they can not be used on any reservations after the expiration. They will expire on February 28, 2017, and they cannot be used on reservations for March 1st, 2017, or any day following. Since reservations can be made up to thirteen months in advance, this brings up the bizarre case where a March 2017 reservation can be upgraded to a suite using a 2015 DSU, but not with a 2016 DSU! Probably the worst devaluation of benefits since I have become a Hyatt Gold Passport Diamond member. Details can be found here and here. 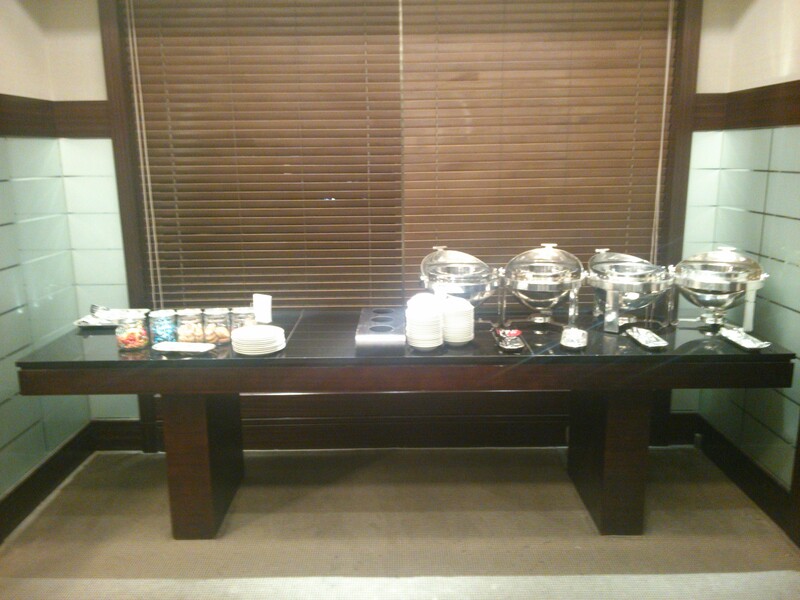 Complimentary daily continental breakfast per guest (max 2 guests), a value of 3000 JPY (approx $35US) per per person per day. For a limited time, Tablet Hotels is offering Tablet Plus benefits on Park Hyatt Tokyo reservations for free! No Tablet Plus member ship needed! Not only are there a ton of great benefits that are normally only afforded to Diamond members, but the Tablet Hotels rate can actually turn about to be cheaper than booking direct through Hyatt. Make sure that “A Gift For You” section displays before making your reservation. 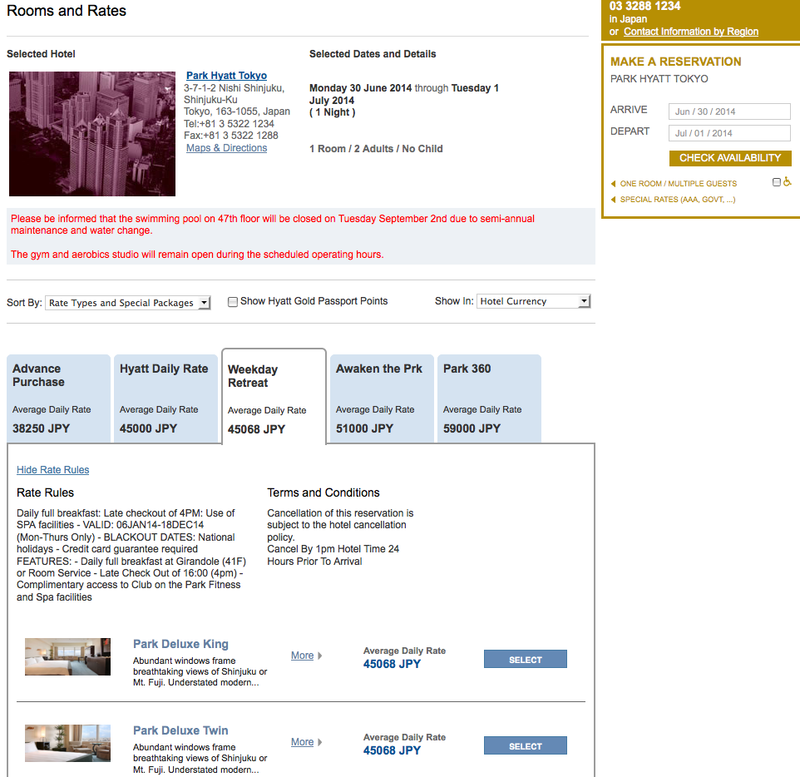 Park Hyatt Tokyo can be stingy about making base rooms available on their website. As the Tablet Hotels reservation includes a complementary room upgrade (based upon availability, but which should very likely be available on week days such as this), you would pay over 7000 yen less for the same room, free breakfast, free spa access, and 4pm checkout! Even though you won’t get Hyatt points for the stay, if you are not already a Diamond member, then I think that these benefits more than make up for that. This is one of the rare occasions where I would recommend booking the Park Hyatt Tokyo via a third party booking service. 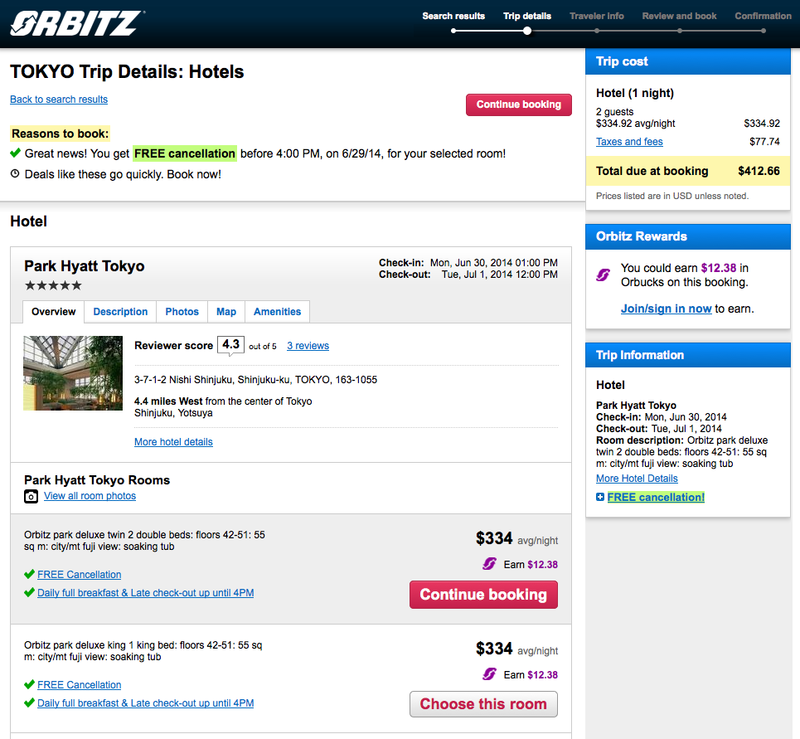 30% Holiday Promo sale at Tokyo Hyatt Hotels coming soon (again)? As followers of my Twitter feed, (the place where I first post my Tokyo Hyatt related breaking news) already know, for a couple of hours the Park Hyatt Tokyo was offering a “Holiday Promo” rate, offering 30% off of the Hyatt Daily Rate. Not only was this a great discount, but it also offer seemed to offer special inventory that was not available with any other rate. Unfortunately, I only got one screenshot from the Hyatt app on my smart phone (the rate also showed up on the regular Hyatt site), but it shows that, at 10:35am Friday Tokyo time, there was availability for a Park Deluxe Room on New Year’s Eve for under $500, the lowest rate that I have ever seen for that special date. For weekdays in January, I was seeing Park King rooms going for under $300…even cheaper than the $300 Points + Cash rate that would also set you back a whopping 15,000 Hyatt Gold Passport points! 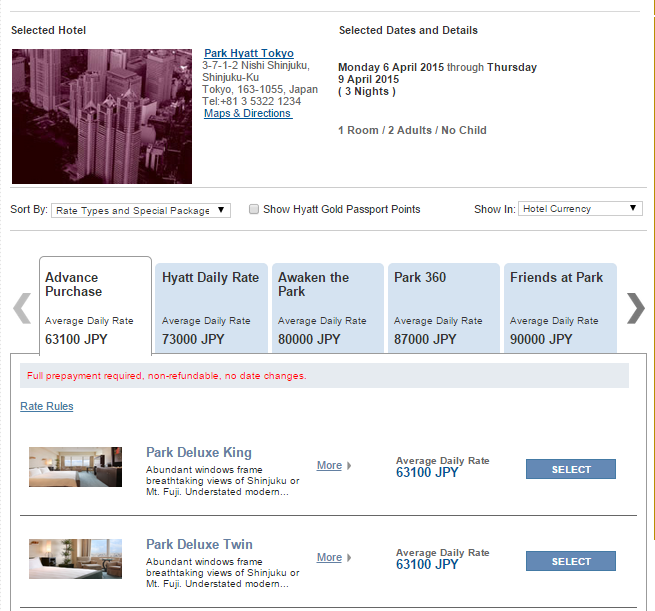 I did not see the Holiday Promo rate anywhere on the Park Hyatt Tokyo website. And soon after noon, the rate was completely gone. However, I do not think that this rate was a mistake. I do think that we will see this rate again very soon, perhaps for every other Tokyo Hyatt hotel as well. This is very similar to a promotion that Hyatt ran last year at this time in the Asia-Pacific, with the terms slightly altered. Going by memory, the Terms and Conditions stated that the reservation was non-refundable, with full prepayment required at the time of booking, must be booked at least three days in advance, and was good for stays between December 1, 2014 and January 31, 2015. Hacking away at the source code, it seems that this year’s special offer code will be APRAC. Although I personally am not interested in a non-refundable rate, I think that this would be a great opportunity for people to get to try the Park Hyatt Tokyo at close to Hyatt Regency Tokyo prices. 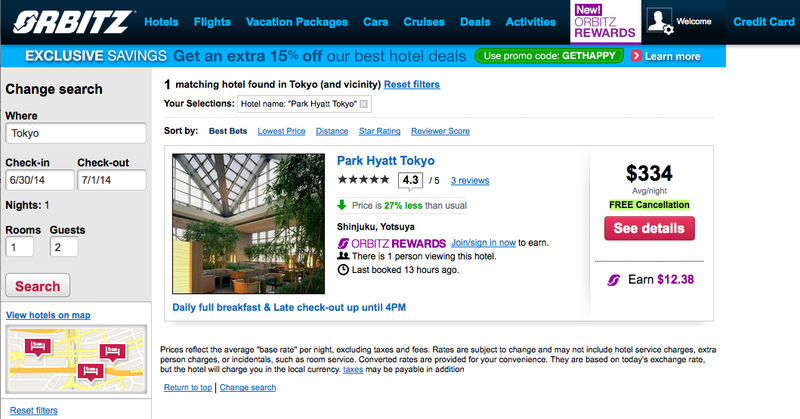 Or, for that matter, perhaps get to try the Hyatt Regency Tokyo at well below Hyatt Regency Tokyo prices. Here’s hoping that the Holiday Promo makes a more long-lasting return in the very neat future! 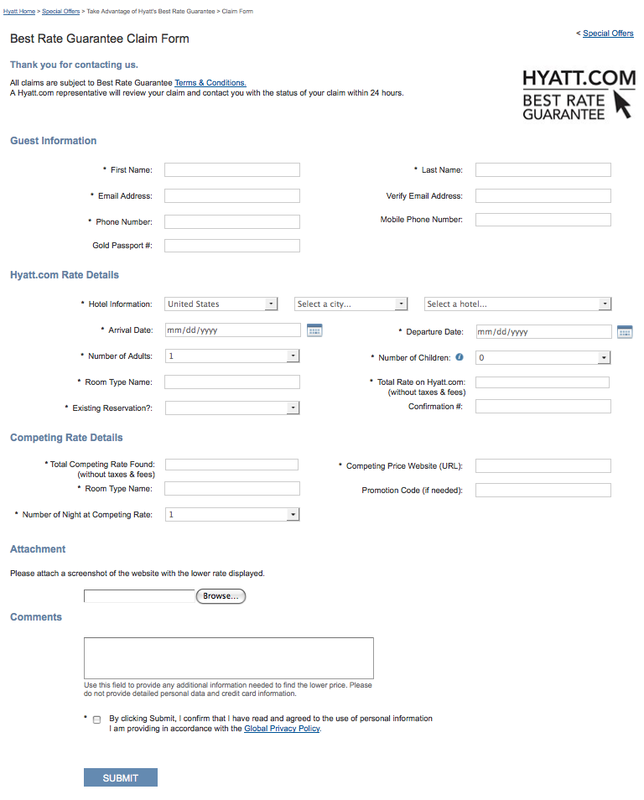 Hyatt has a Best Rate Guarantee. In short, they guarantee that the rates you find on their website are the lowest rates available for booking a room. If you happen to find a place where the same room, under the same conditions (e.g. cancellation rate is same, extra perks offered are the same, etc.) on the same dates are immediately bookable, then Hyatt will not only match the competing site’s rate, but will take an additional 20% off of that. That’s actually a pretty good deal in and of itself. 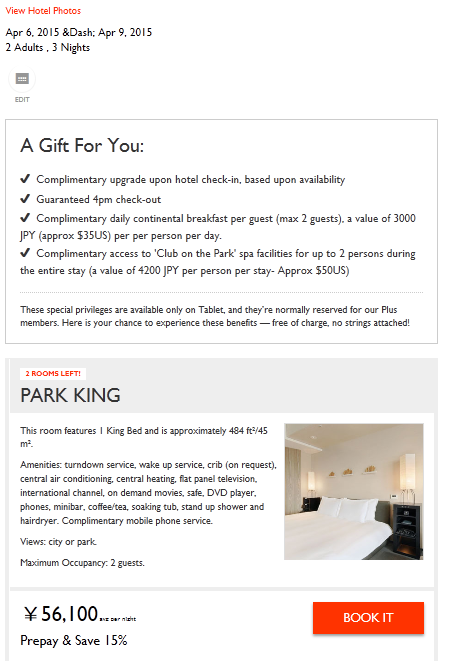 A Park Deluxe Twin or King, with free cancellation, free breakfast, and free late checkout to 4pm (the majority of of benefits that Hyatt Gold Passport members normally get at this property) is significantly cheaper than what we see on hyatt.com. 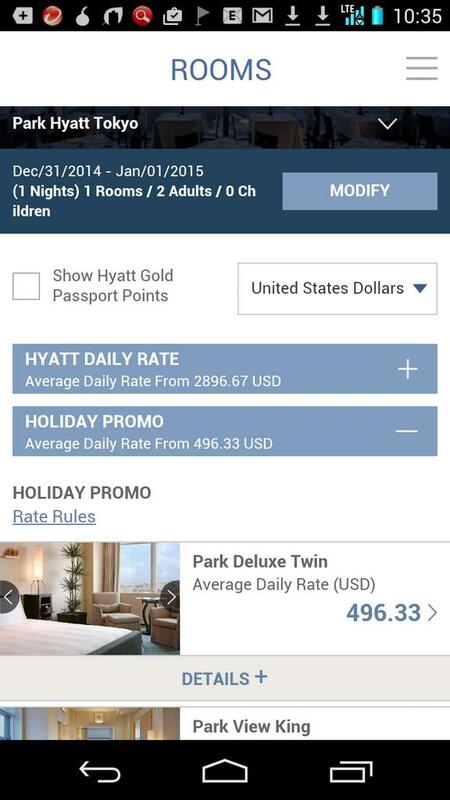 In the event that the Competing Rate is in a different currency from the Hyatt rate, Hyatt shall convert the Competing Rate into the same currency as the rate offered on the Hyatt website. If, after conversion to the same currency, a Competing Rate is less than one percent (1%) lower than the Hyatt rate, then such competing rate shall not qualify for the Best Rate Guarantee. Such deviations are often the result of fluctuations in currency exchange rates and other factors beyond Hyatt’s control. This rate has no problem covering the 1% fudge factor. So Hyatt should take this $334 rate and take an additional 20% off, giving you a 27 hours (1pm check in during the week!) at the Park Hyatt Tokyo with free breakfast for $267.20 plus taxes. But how do we claim this rate? It is long and cumbersome, but your reward will be a $200 savings, and a big feather in your Tokyo Hyatt Fan cap! For the first time in several weeks, availability has opened up for Opening Night at the Andaz Tokyo Toranomon Hills hotel. If you have not yet booked, and would like to be a part of Tokyo Hyatt History, click here to go directly to the reservation page for June 11th.